Christmas is over and if you are like me…. you have eaten so much over the last few days (okay so maybe it has been the last few weeks). Now there are leftovers to deal with and the last push to enjoy all those treats before we hit the New Year’s resolutions. Doesn’t everyone’s resolution include eating healthy or hitting the gym? Yes, I squirreled. I am definitely a breakfast skipper! I am usually up early and always say “it’s too early to eat” or “I’m not hungry.” It is time to re-train my brain. Studies show people who eat a smart breakfast daily are less likely to become obese. Your body functions more effectively when it’s well fueled, so you’ll actually burn more calories throughout the day if you feed it in the morning. Plus, you’re more likely to make poor food decisions if you let yourself get too hungry. So start your day with a light healthy breakfast. Not hungry first thing in the a.m.? Why not keep a piece of fruit and protein bar handy for a mid-morning meal. No hate mail, please. I know there are some who need to eat gluten free or vegan for health reason. I do gluten free to help manage MS symptoms BUT there are some who thing it will help with their weight loss. The simple fact is eating like this does not guarantee weight loss. They can be loaded with calories and fat. Gluten-free foods are sometimes just as carby as their gluten-containing counterparts, and vegan goods may be full of fatty calories. There’s absolutely nothing wrong with sticking to foods which work for your personal needs and lifestyle, but some choices are better than others. That’s why it’s so important to check the nutritional info before you order or buy. Pay special attention to calories, serving size, and servings per container! Even if your spin class promises to burn 800 calories, don’t treat yourself to fettuccine Alfredo and cheesecake just yet. It’s common to overestimate the number of calories we’ve burned — everyone burns calories at a different rate — and you could unintentionally negate your hard work. Even if your estimates are spot on, do you really want to cancel them out entirely? If you’re aiming for weight loss, you still need to take in fewer calories than you burn. Either way, you’re better off just increasing your portion sizes to replenish yourself, not reaching for junk food or totally overdoing it. Check out these ideas for what to eat before and after a workout. If weight management is a priority for you, then yeah, you’re going to want to keep tabs on your calorie intake. YES, eating whole natural foods is good for you. But it’s completely possible to consume way more calories than you burn in a day by eating these foods. Plenty of natural foods are calorie dense — think avocados, nuts, grains — meaning a small portion has a large calorie count. Eat too much of those, and you could pack on the pounds. Believe it or not, the same thing can happen with fruits which are packed full of natural sugar. So eat the good stuff, but watch the portions. No judgement call here – I’ve done this. Although, it may seem like a smart choice, restaurant salads often pack WAY more calories than you think. So if you’re blindly assuming the giant Cobb salad is a better option than a lean petite filet and a side of veggies, you might want to spend some time checking out the restaurant’s nutritional facts. The salad dressing alone often contains hundreds of calories! And when it comes to dessert, treat yourself… but split one with your dining companions. Studies have found we enjoy the last bite the most anyway! Throwback: Loving Yourself When Your Too…. Last week, I had an AHA moment. A moment when the brain fog lifted and I realized I had to stop making excuses for why a few (okay, 20) pounds were back. Yes, I could blame health issues. The truth was I was slowly slipping back into old habits I had BEFORE I lost 100 pounds. Yup, me and my cutie of a daughter (she hates this picture). It is REALLY old but the truth is there aren’t many pictures of me when I was heavy. Back to the AHA moment….I needed to take control of what I could control – my eating. I was repeatedly complaining about “gaining” or not losing weight as hubby’s weight kept going down. The truth was, he was eating healthier and I was secretly eating junk! Okay, so the truth is out, now I have to be accountable. I wanted the capris which fit so good over the last 2 summers to again fit. I wanted the jiggle in my thighs to be gone. I wanted the puffiness in my face to be gone. There was no magic wand but there was the proverbial SMACK on the head which made me realize what I needed to do. It was at the moment I opened my email to find an online special from Weight Watchers. I didn’t delete it, I just let it sit in my inbox. After a lot of prayer and thought, I did it! I signed up again. Hubby loves me not matter what – I mean when we got together, I was on the weightless journey. Over the last two years as I struggled with health issues, I was constantly comparing myself to others. I felt inferior because I hadn’t stuck to the program. Once you stop comparing, you realize you will always be too fat, too skinny, too tall, too this when you compare yourself to others. The comparison game will kill your dreams before you even start. Know you are exactly what you’re supposed to be—one of a kind and beautiful. 2. Change the way you see. Have you had experiences where people you told you how pretty (or nice you look) BUT you thought you were unattractive? I have. Where you say “thank you” and add “but I have….” negating their compliment. Dr. Wayne Dyer often said, “When you change the way you look at things, things you look at change.” I know this is true because I often experience it in my life. Focus on what is wonderful about you, whether it’s your kindness, generosity, or thoughtfulness. When you focus on the internal features, the external features seem to start to sparkle with radiance. It’s not that you changed—your perception did. How many times have you looked at a picture or a video of yourself and a barrage of negative self-talk dominated your thoughts? Those inner gremlins start to take over and before long they are in control. How sad it would be if we allowed those negative voices to stop us from offering what we have to give: our knowledge, ideas, voice, gifts, our love, and more? We would be withholding these things from people who might need and benefit from them. My Fierce Cheerleader and Abundance Coach, Eryka Peskin, has taught me how to celebrate those negative things so they no longer have control over my life. Try it. Step back and reframe those negatives into a positive. You have so much to give (even if you feel like you don’t): your unique gifts, your experience, courage, ingenuity, creativity, and so much more. Don’t let the negative voices stop you from sharing what you have. The world (your neighbors, your friends, your grandma, or whatever your world may be) needs it. The truth is, there will always be someone or some people who will find you undesirable or unlovable, but the world is also full of people who will feel the opposite. Ultimately, the deeper truth you have to find within yourself is this: If no one loves me, will I love myself? YES, I will love myself. In the moments when I don’t like what I see in the mirror, I make a choice. I make a choice to give myself total acceptance and love for all that I am: the good, the ugly, and the bad. Will you make the choice to love yourself when you’re too short, too tall, too fat, and too skinny? This post first appeared in my blog on March 23, 2015. I have shared it multiple times since them. I still do this every morning (even when I am away). Over the holidays (okay, so maybe before, a few pounds started to creep back on. I was no longer at my Weight Watcher’s goal weight and I was discouraged. So, what is a girl to do? I re-joined online with Weight Watchers and am embracing the new program. I am now in my second month and it has been a struggle. I could give you a million excuses but the truth is I haven’t been motivated. I have been accountable though so I figure that is a step in the right direction. One of the things I slacked on was drinking my warm water with lemon first thing in the morning. Yes, before my coffee. Yes on a totally empty stomach. For those who don’t know the wonderful powers of this combination, I will admit I didn’t either until an episode of Dr. Oz. To say the least, I was skeptical it could help my IBS or my hunger or anything. Then came the second confirmation this could work. We were at the doctor discussing some new meds for IBS. Doc suggested something natural many of his patients were trying – it worked. Okay, I am game at this point. Guess what it was? 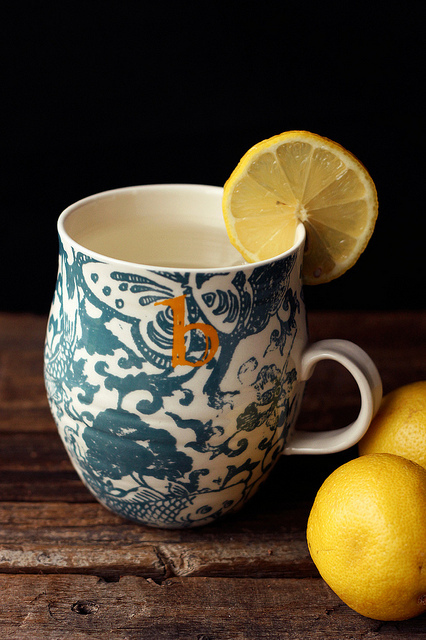 YUP – warm water and lemon first thing in the AM. Okay, if one person says it is a duck – you question it. If two people call it a duck, there is a possibility. If 3 people say it, guess what? It is probably a duck. I heard this saying for years when I was in my early years of recovery. So, I some bought lemons at the store to try this exact thing. 1) Aids Digestion. Lemon juice flushes out unwanted materials and toxins from the body. It balances maintain the pH levels in the body. Lemons are also high in minerals and vitamins and help loosen ama, or toxins, in the digestive tract. Lemon juice helps to relieve symptoms of indigestion, such as heartburn, belching and bloating. The American Cancer Society actually recommends offering warm lemon water to cancer sufferers to help stimulate bowel movements. 2) Cleanses Your System / is a Diuretic. Lemon juice helps flush out unwanted materials because lemons increase the rate of urination in the body and helps keep your urinary tract healthy. 3) Boosts Your Immune System. Great for fighting colds. They’re high in potassium, which stimulates brain and nerve function. Potassium also helps control blood pressure. 4) Balances pH Levels. Drinking lemon water regularly can help to remove overall acidity in the body, including uric acid in the joints, which is one of the primary causes of pain and inflammation. 5) Clears Skin. Helps decrease wrinkles and blemishes and is vital for healthy glowing skin. 6) Energizes You and Enhances Your Mood. Provides your body with more energy when it enters the digestive tract. The smell of lemon juice can brighten your mood and help clear your mind. Lemon can also help reduce anxiety and depression. 7) Promotes Healing. Promotes wound healing, and is an essential nutrient in the maintenance of healthy bones, connective tissue, and cartilage as well as displaying anti-inflammatory properties. 8) Freshens Breath. Besides fresher breath, lemons have been known to help relieve tooth pain and gingivitis. 9) Hydrates Your Lymph System. Warm water and lemon juice supports the immune system by hydrating and replacing fluids lost by your body. 10) Aids in Weight Loss. Lemons are high in pectin fiber, which helps fight hunger cravings. Health benefits are courtesy of www..positivehealthwellness.com. So, was this enough to convince you to try a cup of lukewarm water and lemon in the morning? Which of these benefits excite you the most?? ?